Merchants, Before You Fall, Maid of The Mist, Outsiders, Shorelines. 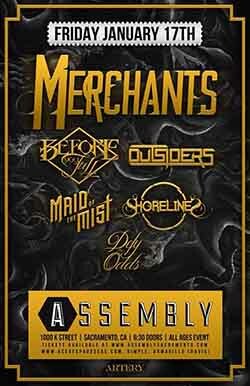 Merchants take over the Assembly Music Hall in Sacramento on January 17th, 2014 and Rock Hard LIve was there to interview them and enjoy the show. Also on the bill were Before You Fall, Maid of The Mist, Outsiders, Shorelines, and Defy The Odds.